Note: Creation of this applet was inspired by a related-rates problem taken from Section 3.9 (Related Rates) from J. Stewart's Calculus (Early Transcendentals) 7/E text. This problem has appeared in his earlier texts as well. 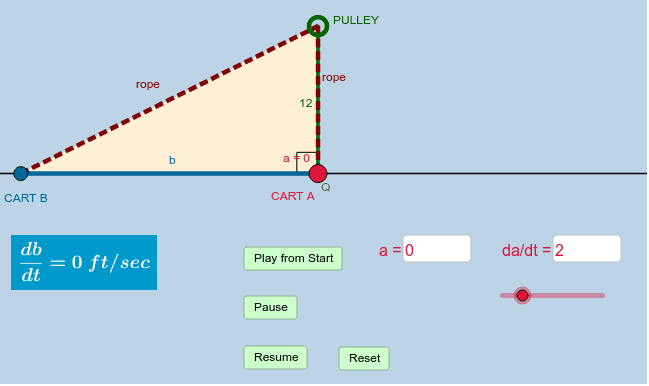 Problem: Two carts, A and B, are connected by a rope 39 ft. long that passes over a pulley. The point Q is on the floor 12 feet directly beneath the pulley and between the carts. Cart A is being pulled away from Q at a speed of 2 ft/sec. How fast is cart B moving towards Q at the instant when cart A is 5 ft away from Q? Be sure to write a dynamic model and use implicit differentiation to differentiate both sides of your equation with respect to the appropriate variable. Determine the solution to this question and check your answer using the applet below. Note: You can create different animation speeds for cart A if you wish. (Units of da/dt are ft/sec).